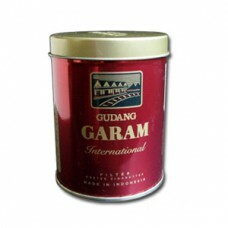 Tin Canned Gudang Garam International Filter is made from high quality tobacco and clove leaves, for all smokers who appreciate the art of savoring kretek. The impressive tin packaging combined with the advance technology and hereditary kretek formula makes Gudang Garam International filter capable of offering irreplaceable smoking experience for any kretek connoisseurs. 1 tin can contain 50 cigarettes.